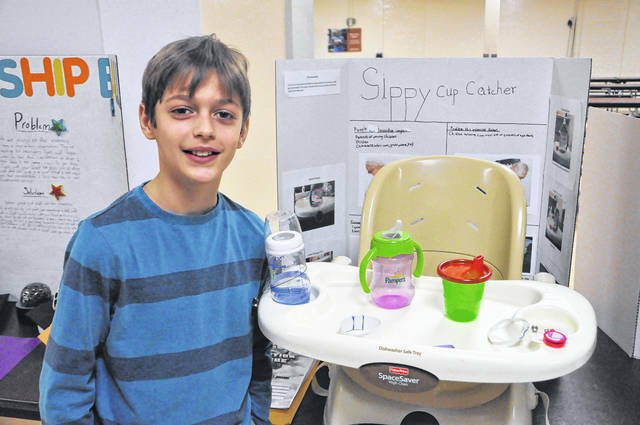 Nicholas Hejmanowski, a fifth-grader at Smith Elementary in Delaware, stands in front of his invention, The Sippy Cup Catcher, Tuesday during the Invention Convention. Hejmanowski devised a contraption consisting of a retractable cord and elastic band to prevent sippy cups from falling to the ground. Ava Vogel and Aly Diehl, fifth-graders at Carlisle Elementary in Delaware, stand in front of their invention, The Buddy Bucket, Tuesday. The pair explained that the bucket is designed to keep everything you need in one place when you are sick. Nicholas Hejmanowski, a fifth-grader at Smith Elementary in Delaware, stands in front of his invention, the Sippy Cup Catcher, as he prepares for his presentation during the Invention Convention held Tuesday morning at the Willis Education Center. Hejmanowski begins by explaining the problem: babies knock their sippy cups off of their trays. He then pushes a sippy cup in the middle of his project off the front of the tray, and it plummets to the floor. “My solution…” he says before gesturing to a retractable cord anchored on one end to the tray and affixed around a sippy cups waist with an elastic band at the other. He bats this one of the side as well, and the cord catches the cup for a millisecond before the weight of the cup pulls the cord, and it’s anchor, to the floor with a crash. He moves to the other side of his project, where a similar contraption binds a sippy cup to the tray. He pushes this one over the side as well, and it falls, but the cord catches after a few inches and the cup hangs in the air. Hejmanowski was one of dozens of Delaware City Schools students who took part in the Invention Convention Tuesday morning. Coordinator Jennifer Day, a gifted intervention specialist with the district, said that in the competition, students were supposed to find a problem and devise an invention to solve it. 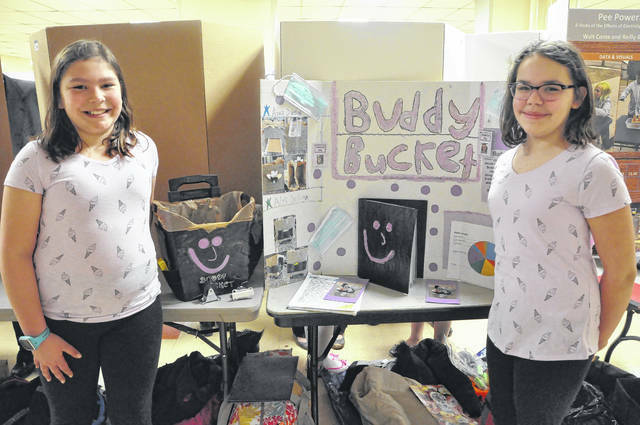 Other inventions included a strap for the back of school bus seats to hold backpacks, a vest that allows individuals to take a drink without using their hands, a blanket to keep warm on sleds, and The Bucket Buddy, an invention devised by Carlisle Elementary fifth-graders Ava Vogel and Aly Diehl. Diehl chimes in to explain the chalkboard is for keeping track of when you last took your medicine. Diehl said she enjoyed both making the project and working with Vogel. Day said the students who score high enough on their inventions will go to a statewide competition. “I would hope they would gain a sense of empowerment to know they have the ability to solve problems and make change,” Day said. Hejmanowski said he also really enjoyed working on his project. “The project was really fun to make,” he said. Hejmanowski added he wished he could have made a mechanism to retract the cup, but he realized the force necessary would mean a baby couldn’t pull the cup off the tray to drink from it. “I learned babies take a lot of care,” he said. https://www.delgazette.com/wp-content/uploads/sites/40/2018/03/web1_DSC_1346.jpgNicholas Hejmanowski, a fifth-grader at Smith Elementary in Delaware, stands in front of his invention, The Sippy Cup Catcher, Tuesday during the Invention Convention. Hejmanowski devised a contraption consisting of a retractable cord and elastic band to prevent sippy cups from falling to the ground. https://www.delgazette.com/wp-content/uploads/sites/40/2018/03/web1_DSC_1336.jpgAva Vogel and Aly Diehl, fifth-graders at Carlisle Elementary in Delaware, stand in front of their invention, The Buddy Bucket, Tuesday. The pair explained that the bucket is designed to keep everything you need in one place when you are sick.